CE Back Office welcomed reading charity Beanstalk to their Nantwich office last week. Together with Beanstalk we were celebrating 6 months successful volunteering partnership. During this time, CE Back Office have provided volunteer readers to Bridgemere C of E Primary School in Cheshire 2 afternoons a week as part of our CSR (Corporate Social Responsibility) commitment. Michelle from Beanstalk commented “Our Corporate partnership with Back Office has worked really well Emma and Andy have been so supportive and they have helped support children in the local area improve their literacy skills so I cannot thank them enough. We are always looking for new businesses to work with so please get in touch if you would like to discuss”. Beanstalk is a national charity that provides one-to-one literacy support to children who struggle with their reading ability and confidence. The programme with CE Back Office has been a success. So far they have helped 9 children improve their reading capabilities. Andy Jones, MD of CE Back Office, commented; ‘It’s been a pleasure to work with a fantastic bunch of children and I have been proud to be a part of their development over such a short period’. Andy Jones and Emma Crowe from CE Back Office celebrate 6 months successful CSR partnership with charity Beanstalk. At CE Back Office, our core mission statement is about putting people first. This ethos follows in all our business activities including working with our clients and their employees, as well as supporting our own internal team. We wanted the same values to be reflected in our CSR commitment. The partnership with Beanstalk has allowed us to extend this mission to our local community. As a payroll bureau, we regularly see that the importance of people development to business success. Volunteering with Beanstalk is a reminder of how people development and education starts at such an early age. We would encourage businesses of all sizes to get involved with their local community. It is vital we put the support in today to ensure we have access to a skilled work force in years to come. 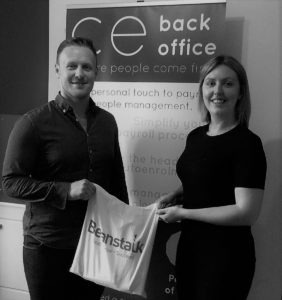 CE Back Office would like to thank Beanstalk for the opportunity to work with them and look forward to supporting more children with their reading development. If you would like to work with Beanstalk you can contact Michelle Searle or visit the Beanstalk website.